Teach your fish to eat our of your hand! Stand near your pond or tank, toss some floating food onto the surface, and stand still until your fish have eaten the food. Repeat this process at each feeding for several days, then start slowly moving closer every couple of feedings. Once they are comfortable eating with you right next to the pond, tap the side of the pond with a small rock to create a noise prior to feeding them that will alert them it is time to eat. 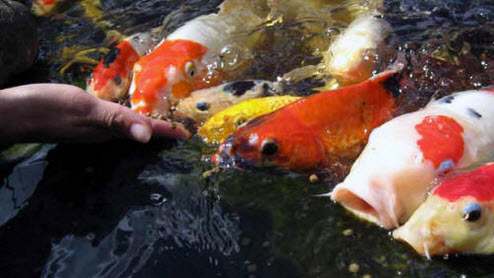 Once your fish are used to the food call sound, put some food in your hand and hold your hand just below the surface to allow the food to float slowly out of your hand. Repeat the last step, slowly tilting your hand to allow the food to float out more slowly each time.